Haven't done much few days had beed to the doctors and cycled to Rotterdam to pick up some Cokin filters and met some interesting people. Closed it up and looks more like the camera now only still need to make extra side and back blue print to make it easier to determine some parts. 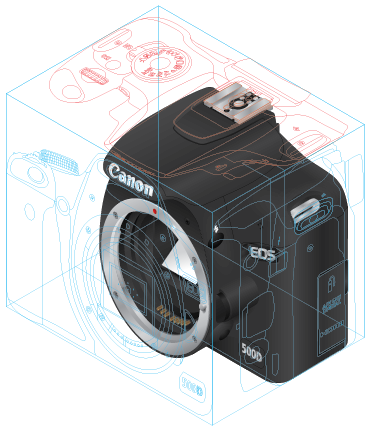 Also learned now that the new CS5 got a perspective tool but what I have seem people using it for its mostly been people making buildings and not allot of difficult shapes like this camera. I have to say I am not using CS5 at all I am using CS2 about 3 generations back which still works fine fore making illustrations and I have to say the new stuffs are interesting but not really needed for what I am illustrating. I might actually add the lens plus Cokin system to this illustration and make a short animation.